""This tragedy was the predictable and predicted result of decades of unacceptable, greed-driven, and willful ignorance of safety"
There are new developments in the deadly Duck Boat tragedy in the stormy waters of a Missouri lake. In a new lawsuit, an attorney from our area calls the accident a "willful ignorance of safety." The lawsuit filed Sunday in U.S. District Court in Kansas City seeks $100 million in damages on behalf of two of nine members of an Indiana family who died when the tourist boat sank July 19 at Table Rock Lake near Branson. Others killed were from Arkansas, Illinois and Missouri. "This tragedy was the predictable and predicted result of decades of unacceptable, greed-driven, and willful ignorance of safety by the Duck Boat industry in the face of specific and repeated warnings that their Duck Boats are death traps for passengers and pose grave danger to the public on water and on land," the lawsuit alleges. Ripley Entertainment Inc., Ride the Ducks International, Ride the Ducks of Branson, the Herschend Family Entertainment Corp., and Amphibious Vehicle Manufacturing are named in the lawsuit, which was filed by a team led by a Philadelphia-based legal firm that has litigated previous lawsuits involving duck boats. The vessel sunk last week after severe winds caused the boat to capsize. Robert Mongeluzzi, a Philadelphia-based attorney, said Monday the family's priorities are to find out what happened and to make sure "no one ever dies again inside a death trap duck boat." Mongeluzzi's law firm won a $17 million settlement after two Hungarian students drowned in a duck boat ride in Philadelphia in 2010. 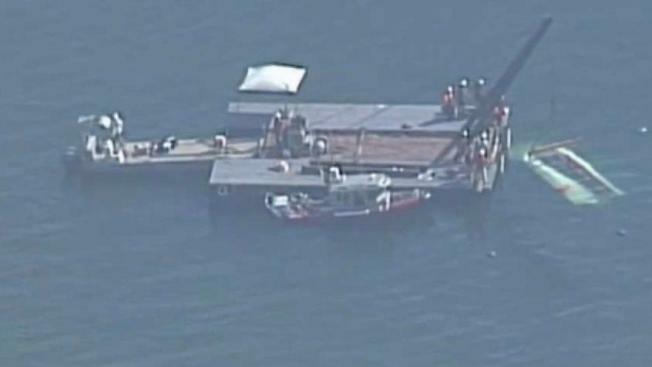 Ripley Entertainment remains "deeply saddened" that one of its boats sank but would not comment further because a National Transportation Safety Board investigation is continuing and no conclusions have been reached, spokeswoman Suzanne Smagala said in a statement Monday. The lawsuit says the boat operators violated the company's own policies by putting the boat into the water despite the weather warnings. It also says the captain violated protocol by not telling passengers to put on life jackets when the water got rough and instead lowering plastic side curtains, "thus further entrapping passengers in the soon-to-sink vessel." The lawsuit cites an August 2017 report from private inspector Steve Paul, who looked at two dozen of the duck boats. The report warned Ripley Entertainment that the vessels' engines — and pumps that remove water from their hulls — were susceptible to failing in bad weather. It also accuses the defendants of ignoring warnings the NTSB issued in 2000 that the vehicles, which are designed to operate on land and water, should be upgraded to ensure the boats remain upright and floating in bad weather. The 2000 recommendation from The NTSB was issued after a duck boat sank May 1, 1999, on Lake Hamilton in Arkansas, killing 13 people. A woman on a nearby boat took video of two sightseeing duck boats struggling through a choppy lake in Branson, Missouri, Thursday. At least 11 people died when of the boats capsized and sank. When Robert McDowell, then-president of Ride the Ducks Branson, responded that upgrades would require significant costs, NTSB Chairman Jim Hall said the recommendations were made because the agency believed "immediate action was necessary to avoid additional loss of life." The lawsuit says the defendants ignored the warnings. It also alleges McDowell designed and developed the stretch duck boats, including the Stretch Duck O7 that sank, despite having no engineering training. The National Weather Service issued a severe thunderstorm warning for the area including Table Rock Lake about 30 minutes before the boat went onto the lake with 31 people on board. 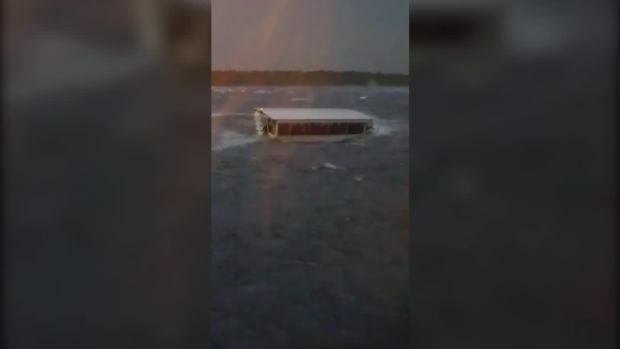 The NTSB said Friday that a preliminary review of video and audio recordings from the boat showed that the lake changed from calm to dangerous in a matter of minutes. The agency emphasized it had not drawn any conclusions on what caused the boat to sink. The captain, who operated the boat on the water, survived and has acknowledged he was aware of the weather warnings before the trip, according to the NTSB. Another crew member who operated the boat on land was among those who died. The lawsuit was filed on behalf of the estates of Ervin Coleman, 76, and Maxwell Ly, 2. Maxwell was identified by authorities as Maxwell Coleman after the boat sank. The lawsuit accuses Ripley Entertainment and the other defendants of negligence, product liability, outrageous conduct, wrongful death, negligent infliction of emotional distress, and violating the Missouri Merchandising Practices Act.